Safety is always a top priority among farmers and ranchers. 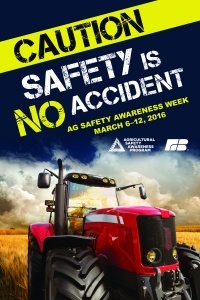 To recognize the importance of safety in agriculture, March 6-12 has been designated Agricultural Safety Awareness Program Week. This year’s theme is “Caution-Safety is no Accident.” The theme will focus on a different safety topic each day of the week, including all-terrain vehicles, tractors, children on the farm, grain bins and sharing the rural road with farm vehicles. The American Farm Bureau has an array of resources available to help bring awareness to safety in rural communities, including videos, social media posts and a safety toolkit. For more information, visit http://www.fb.org/programs/healthandsafety/home/.